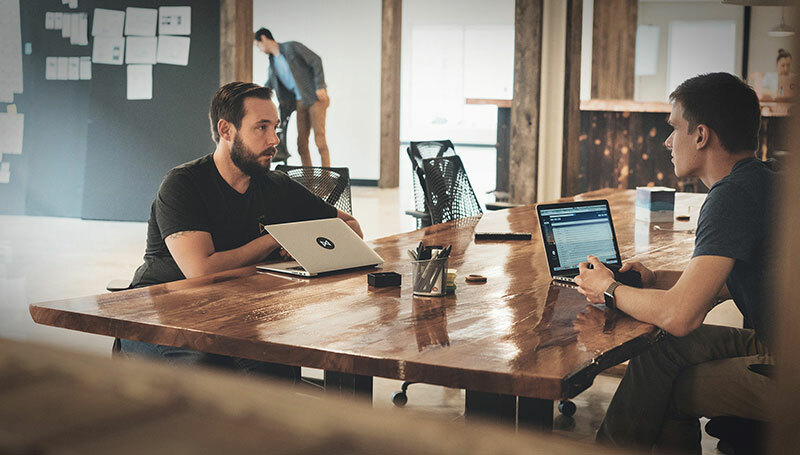 Based in Austin, Texas, Handsome is a digital agency with a focus on experience design, innovation, and technology. They’ve worked with Nickelodeon, FedEx, Facebook, and Home Depot, to name just a few. We chatted with Brandon Termini, Executive Creative Director, and Anna Krachey, Experience Design Lead, about creating a great team culture, how designers can prepare for the future, and the thing nobody should ever do inside an office. All images courtesy of Handsome. We believe that amazing results can come from small, dedicated teams of experts. A key word here for us is dedicated. 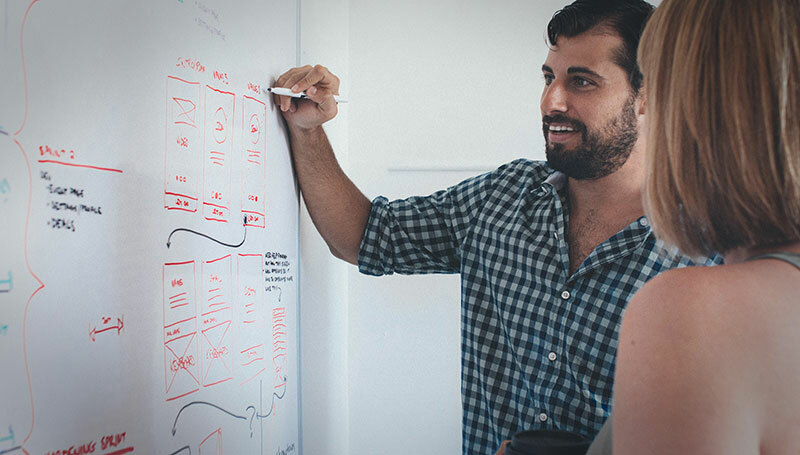 When we engage with clients we build a team comprised, at its core, of a product manager, experience designer, product designer, and technologist. These people are dedicated to our client—partnering, integrating, and collaborating with the client throughout the process. Depending on the needs of the engagement, we’ll assign other specialists to the team such as brand designers, strategists, mobile engineers, etc. This dedicated team model allows the people working on the project to be truly immersed in our client’s market, organizational culture, and the problem space. Everyone puts their hands on the problem, everyone speaks with and observes the users, and everyone contributes in ideation, prototyping, and iteration. We don’t believe in the assembly line approach we see at other agencies. We don’t see the value in large, heavy, hierarchical teams. How can organizations create a great work/team culture? 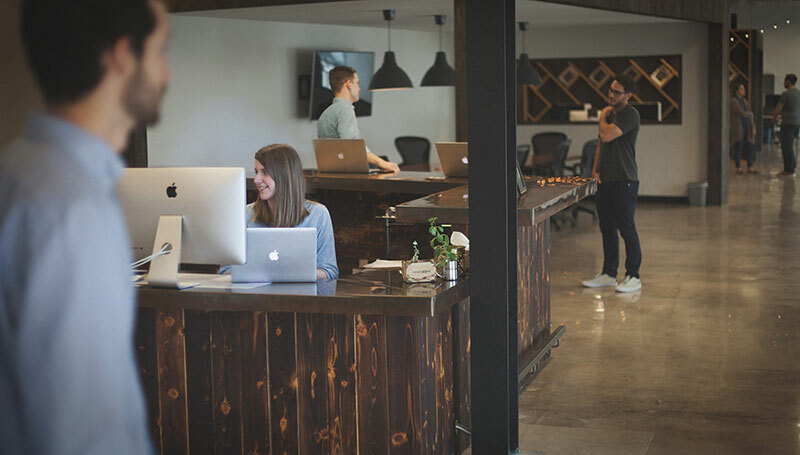 Our entire agency and design teams are comprised of individuals who are curious, ambitious, and engaged in learning. We intentionally hire team members who want to individually learn and grow as much as possible and also want to help each other develop and grow skill sets. This has a resounding effect on our office culture and on our design practice—as our team members grow, we’re constantly pushing and iterating on our practice to be as collaborative, efficient, and current as possible. In order to push through ambiguity in solving complex problems, each team member has to trust one another, be humble to each other and to the process, and truly become immersed in the problem space as a unit. Collaboration and communication are central to our culture. During the ideation phase of design we’ll time-block sketch sessions in order to rapidly ideate. In between time blocks, we’ll hang our ideas on the walls, walk around, look, ask questions, and give feedback. Generally, this is a time when we talk about the benefits and drawbacks of a particular design, give encouragement, and get excited about one another’s ideas about how this thing might take shape. This open style of communication allows us to build rapport and trust among designers and in our design teams. A key part of making collaboration successful is our ability to be flexible enough to know when we need to come together as a team, and when it’s time to be heads down and get stuff done autonomously. We believe that there should never be a handoff, but a continual team effort to work towards a solution. So, we involve technology early on in the process. Our technologists collaborate closely with designers to help push products and experiences creatively forward. We try to strike the right balance of next-level ideas with feasible near-term solutions. Leveraging tools like InVision has definitely helped us in the past to quickly get feedback on proposed solutions throughout the design process. How do you hire new people? What catches your eye when you’re looking at someone’s portfolio? What makes you immediately move onto the next applicant? We’re refining our hiring process and currently it’s different for every role. Because rigor in research is such a critical part of our process, when we’re hiring UX designers we’ll often have candidates create discussion guides for an assigned research topic (generally one that we already know well, internally) and then interview a participant of our choice (not a designer!) during the interview. It gives us a glimpse into their ability to wrap their minds around a problem, interface with participants, gather data and to synthesize on the fly. We debrief with the candidate to get a sense of their openness to critique, dialogue, and growth. It’s been really successful in helping us to get to understand aspects of candidates quickly and their aptitude and interest for our culture and process. Pass on a candidate? Inability to tell the story of their work and lack of rigor behind design decisions. For hiring visual designers, we start by culling candidates who show aptitude for creating design with a refined aesthetic, who are experimenting with motion design, and who want to make experiences that are delightful to use, and not just look at. From there, it’s all about how they talk about their work, their ambition for growth, and how we think they’d fit into our collaborative, close-knit culture. Aside from having a design process that encourages exploration and open dialog, we think the trust among team members stems from the culture we’ve fostered here. We’ve focused on creating a culture of collaboration, mentorship, and autonomy. Trust is instilled when teams have a shared understanding of the challenges at hand and shared ownership in a holistic vision. We build trust as a team when we’re grappling with ambiguity. We take pride in our ability to navigate through the unknown, making decisions that build toward successful experiences. Where do you see the design industry headed, and how can designers prepare for it? At Handsome, we believe the future of the design industry is one where delightful and thoughtful customer experiences will become a standard. 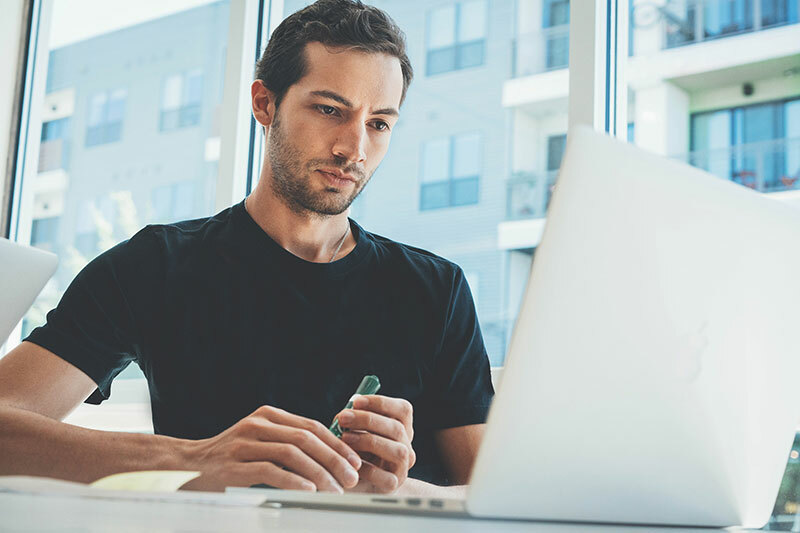 As tools become more powerful and easy to use and the boundaries of design continue to blur, clients will exceedingly expect more output and at a faster rate. In this world, designers will be expected to be even more multi-faceted in order to survive; we will be forced to think more strategically about business problems and design holistic brand experiences that solve for them. Our advice to designers is never be satisfied with your knowledge base. Always seek out savvy ways to get better at your craft and to add to the tools available in your proverbial toolbelt. How does InVision save you time? 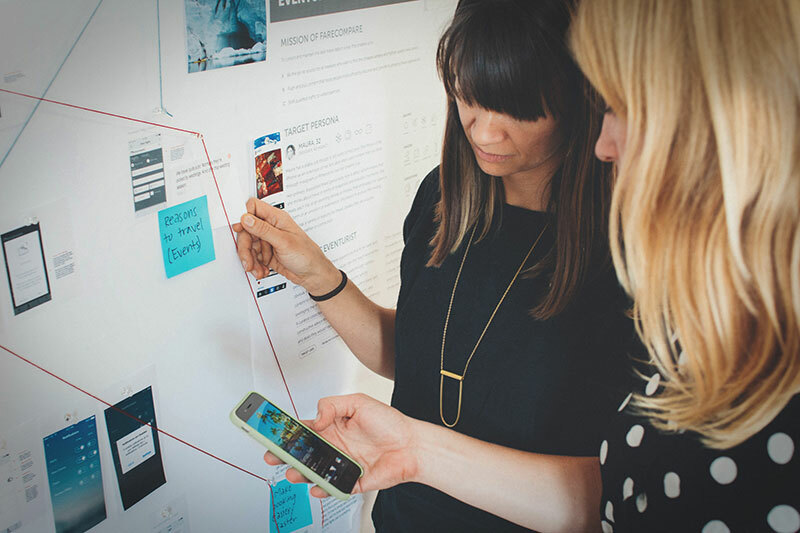 InVision is a critical part of our design process. We use it to quickly create prototypes that we can test with our users. The comment feature allows to document our feedback contextual as well as to discuss internally. Using InVision’s transition features and GIF support also have proven invaluable with our ability to present prototypes that feel alive before we’ve put in the time for motion design. Actively listen and reflect. Both with colleagues and with clients. Make things fast. Set a timer. Get your ideas out and down. Externalize. Get feedback. Once you’ve got a direction, then you can go back and solidify details. That applies to sketching and to strategy docs, etc. Never stop learning. Design is always evolving—and you should be, too.